Proof of the carnage unleashed at Soldier Field against the Green Bay Packers on December 7, 1980. 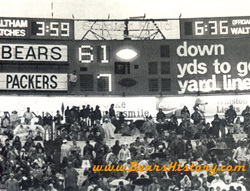 The Bears entered the 1980 season with high hopes, having made the playoffs in 1979. There was plenty to look forward to as the future looked bright. However, the team probably had a bad feeling as soon as opening day wrapped up. On opening day against the Packers at Lambeau Field, both teams had battled to a 6-6 tie at the end of regulation. In overtime, Packers kicker Chester Marcol (dubbed the "Polish Prince" by former Bears coach Abe Gibron) lined up for the kick-which was low. The kick was blocked by veteran Bears defensive tackle Alan Page-making the Bears believe they had caught a break. Murphy's law ruled the day and year for the Bears, however, and the ball bounced right in to Marcol's hands, and he waltzed into the end zone, giving the Packers a 12-6 win. In the 1980 home opener against New Orleans the next week, the Bears did pull of a 22-3 win over New Orleans. Walter Payton rushed for 180 yards in this game. Despite the storng showing, they followed that up with a 34-14 loss against Minnesota at Soldier Field. Although the Bears did lose this game, they did complete the longest Bears pass play ever at Soldier Field- an 80-yarder from Vince Evans to Rickey Watts. The following week, Chicago rolled into Pittsburgh to take on Terry Bradshaw and the World Champion Steelers, and got spanked 38-3. After the debacle in Pittsburgh, Chicago defeated Tampa Bay, a team that had advanced to the NFC Championship Game just the year before, 23-0, behind another strong rushing performance from Walter Payton. After Tampa, the Bears traveled to Minnesota and lost 13-7 at Metropolitan Stadium. The first half of the 1980 season wrapped up after one more win, against Detroit, and then a loss at Philadelphia in a rematch of the 1979 wild-card playoff. At the midway point of the season, the Bears were again 3-5. Unfortunately, the 1980 season did not contain any of the magic of 1979. The team continually rotated quarterbacks, between Mike Phipps, Vince Evans, and even Bob Avellini, which did not lend any stability to the club. After losing a close Monday Night game at Cleveland, the next week, the Bears set a club record by rolling up 21 first-quarter points against Washington. A 14-point second quarter led to a 35-21 win. Earl Campbell and the Houston Oilers defeated the Bears 10-6 the next week. On November 23rd, Walter Payton was ejected from the game at Atlanta after a referee ruled Payton pushed him (Payton was pushed INTO him by another player). This resulted after a ridiculous call during which Payton placed the ball on the ground, but the referee ruled it a fumble. Two other highlights remained in the 1980 season. On Thanksgiving Day, the Bears and Lions battled to a 17-17 tie as time expired. David Williams promptly returned the opening kickoff for a touchdown, ending the shortest overtime game in NFL history, a mark that still stands in 2000. Then on December 7th, Chicago massacred Green Bay 61-7, breaking a ton of records on the way. It was claimed by many that the Bears were stealing Green Bay's offensive signals from the sideline, a claim no one in the Bears organization has denied. After the Green Bay win, Chicago learned that they had been eliminated from playoff contention. The team ended the season with a 7-9 record, and looked toward 1981. No offense at the Met. All points in first half. Passing: Vince Evans- Evans started the final 10 games of the 1980 season, passing for 2039 yards with a QB rating of 66.1. He threw for 11 touchdowns, but also 16 interceptions. Rushing: Walter Payton-Payton slowed a bit from '79, rushing for 1460 yards and 6 touchdowns. He also caught 46 passes for 367 yards and a touchdown. Receiving Yards: James Scott-Led the team in receiving yards with 696 and three touchdowns. Payton was the leader in receptions. Scoring: Bob Thomas- Thomas hit on 35/37 PAT attempts (missing 2 in the 61-7 victory over Green Bay) and made 13/18 field goal attempts for 74 total points. Sacks: Dan Hampton- Hampton led the Bears in sacks for the first of many years with 11.5 in his second season. He also had 73 tackles and 2 forced fumbles. Interceptions: Len Waltersheid-Valuable reserve defensive back started one game each at strong and free safety and led team with four interceptions. Mike Phipps started the first six games of the 1980 season before relinquishing the job to Vince Evans for the final 10. Roland Harper returned from his '79 injury to assume his normal role in the backfield with mate Walter Payton. The same offensive and defensive lines started as in '79. Cornerback Alan Ellis also returned from injury, replacing Virgil Livers, who was not back with the team. From left to right: Offense Vince Evans, Walter Payton, Roland Harper, James Scott, Brian Baschnagel, Ted Albrecht, Noah Jackson, Dan Neal, Revie Sorey, Dennis Lick, Robin Earl, Bob Thomas. Defense Mike Hartenstine, Alan Page, Jim Osborne, Dan Hampton, Gary Campbell, Tom Hicks, Jerry Muckensturm, Alan Ellis, Gary Fencik, Doug Plank, Terry Schmidt, Bob Parsons. Hard to see, but that's Walter Payton jumping the pile for a touchdown in 1980 against Green Bay. Nothing could have indicated to anyone what would happen in the season opener between Chicago and Green Bay at Lambeau Field. Both offenses struggled to gain yards and score points through the game, and at the end of regulation each team had mustered only two field goals each. The score was 6-6. On the first posession of overtime, the Packers drove on Chicago and were in position for a 39-yard field goal attempt. Alan Page blocked the kick, which bounced directly into the hands of kicker Marcol. He ran unabated to the end zone for a 25-yard touchdown. No one could believe their eyes. Despite the heroics, the alcoholic Marcol was cut by the Packers several weeks later. On December 7th, an appropriate day for the rematch, the Bears had been working on deciphering the Packer's signals from the sideline to the offense. According to Gary Amato and Cliff Cristl's book Mudbaths and Bloodbaths, various Bear officials debated the usefulness of the signal knowledge, but the result of the game was a 61-7 Bear victory. According to the book, Packer coach Bart Starr refused to shake hands with his counterpart after the game, charging that the score was run up. Couldn't have happened to a nicer bunch of pr***s, said Bear defensive end Dan Hampton. The 1980 season was full of ups-and downs. In the opener, the Bears tied Green Bay at Lambeau to force overtime, then lost the game when a blocked field goal bounced back into the kicker's hands and he ran the ball in for a touchdown. After six games they were 2-6, and Vince Evans was installed as the starting quarterback. Evans threw for the first 300 yard game by a Bears quarterback since 1970 when he passed for 316 yards and a 82% completion percentage in the blowout over Green Bay. The Bears looked dominant in some games, such as the 23-0 shutout over Tampa on Monday Night Football. Another example was the 35 point first half against Washington. It was the most points ever scored by the Bears in a half, then they couldn't score in the second half. In other games against Pittsburgh and Houston, they couldn't score and lost. Despite pounding the Packers 61-7 on December 7th, on that day Chicago was eliminated from playoff contention. On Thanksgiving, the Bears clinched the shortest game in NFL History when Dave Williams returned the opening kickoff for a touchdown. Notable first-round draft picks in 1980 are T Anthony Munoz by Cincinnati, QB Mark Malone in Pittsburgh and WR Art Monk by the Washington Redskins. Malone was deemed the heir apparent to Terry Bradshaw, but never became that guy. Malone's presence would cause the Steelers to pass on drafting local product Dan Marino in 1983. Buffalo knocks off Miami to win the AFC East, Pittsburgh misses the playoffs in the Central. Philadelphia builds on its successful 1979 campaign by winning the NFC East with a 12-4 record, advancing to the Super Bowl, where the wildcard Oakland Raiders win the NFL Championship on a 27-10 victory in New Orleans. Walter Payton earns his final NFC rushing crown. 3rd Round Pick to Dallas for WR Golden Richards in 1978.